Cabrera cashes in: How much money is too much? The most valuable player in sports last week wasn’t Scottie Wilbekin, the NCAA Tournament’s breakout star who led Florida to another Final Four while likely cementing his spot as a 2014 NBA draft pick. It wasn’t Tim Duncan, who was (as always) the rock for the San Antonio Spurs while they extended their NBA-best win streak to 17 games. It wasn’t Novak Djokovic or Serena Williams, who made their respective cases for being the world’s top-ranked male and female tennis players by winning the Sony Open in Miami over the weekend. The king of the sports world last week was Miguel Cabrera, the best pure hitter in baseball, who hasn’t even swung his bat once in an official game in 2014 because his Detroit Tigers don’t play their season opener until Monday afternoon. But Cabrera still gets the crown and still made the headlines because on March 27, he agreed to an eight-year contract extension with the Tigers worth a reported $248 million. 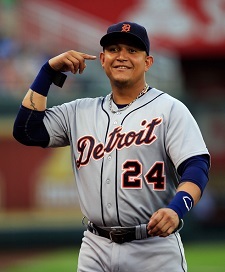 Along with his existing contract, that gives Cabrera a 10-year deal worth $292 million; the richest in baseball history. Cabrera’s deal is so big that it made fellow baseball star Mike Trout’s $144 million extension with the Los Angeles Angels, signed a few days later, look piddly by comparison. It’s so big that people immediately went looking for the most creative ways to break it down — the most popular being that Cabrera will now make more money per at-bat than the city of Detroit’s median annual household income. The contract is big. But is it too big? Is there such a thing as too big a contract? Is there such a thing as too much money for an athlete? And why do we, as sports fans and media, care so much how much money the Miguel Cabreras and Mike Trouts and LeBron Jameses of the world make? I find it odd that in a society where it’s still considered rude to ask somebody how much they get paid, we have no problem not only digging into athletes’ salaries, but also every clause and bonus in their contracts and how much supplemental income they make from endorsements. We won’t ask the person who works in the office next to ours how much they make, and for the most part, don’t judge their right to make it. But everybody seems to have an opinion on how much athletes make and whether or not they deserve it. Do an Internet search right now and see how many results come up for “Most overpaid athletes” (866,000 articles last I checked) versus “Most overpaid CEOs” (600,000 there; and many of them tack on an “underpaid” category) or “Most overpaid actors (440,000) or “Most overpaid politicians (680,000). Is the higher level of interest in allegedly overpaid athletes simply a result of sports being a more popular topic than politics, business or Hollywood? Maybe. But I think it’s driven more by the mainstream idea that athletes deserve their money less than people in those other industries. You’ll often hear people talk derisively about athletes making millions of dollars “just to dribble a basketball” or “just to throw a football” or “to play a child’s game.” What you don’t hear is people snorting that astronauts get paid “just to sit in a tube” or engineers get paid “just to make sure stuff doesn’t break” or firefighters get paid “just to spray stuff.” Sounds ridiculous, right? Totally undervalues what those people do, right? Exactly. And yet we do it to athletes all the time. But it also stems partially from our society’s lack of respect for — or lack of knowledge about — the hard work and intelligence it takes to succeed in sports. It also stems partially from deep-seeded race and class issues. There are a lot of people who, even if it’s not on a conscious level, have a problem with Black and Latino people making more money than them. And a lot of people who have a problem with people who grew up poor making more money than them. And a lot of people who have a problem with people who they don’t perceive as smarter than them making more money than them. There is a perception that religious folks, including Muslims, are opposed to wealth and have something against rich people. Watch any religious TV program, from “The 700 Club” to “The Deen Show,” and you’ll see rich and famous celebrities used as cautionary tales and examples of how money can’t buy what’s really important in life; how even the wealthiest person in the world can still live an empty life without God. But that doesn’t mean religion and riches don’t mix. Islam does not oppose the wealthy, nor does Islam say the pursuit of wealth is wrong. Islam does not oppose sports or healthy forms of entertainment — the Prophet Muhammad was certainly an athlete — and Islam also supports the idea of being compensated fairly. And when you consider how much money is generated by the sports industry, you could actually argue that even the highest-paid athlete is underpaid. Islam has no problem with a rich athlete, or any rich person. As long as that individual uses some of their money to help the needy (including paying the zakat of 2.5% annually), and remembers that they can’t take their money with them when they die, and doesn’t ever worship money and the things money can buy over worshipping Allah, they’re good. If you believe in Allah and the Quran, if you believe that Muhammad is Allah’s last and final messenger and that the Day of Judgment is coming, you’re good in the eyes of Islam — whether you make $30,000 just to put out some fires or if you make $300 million just to hit a baseball.